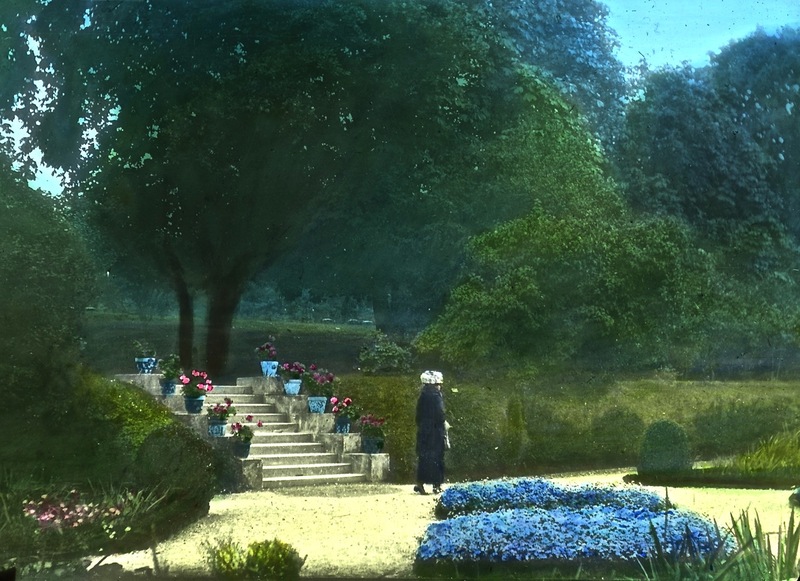 Hand-tinted (3″ x 5″) glass lantern slide of Bagatelle Garden, Paris, France, ca. 1930, photographer unknown. The image is from the Garden Club of America Collection, part of the Archives of American Gardens at the Smithsonian Institution (used here by permission). The Archives hold over 60,000 photos and records documenting 6,300 historic and contemporary American gardens. At its core are almost 3,000 hand-colored glass lantern and 35mm slides donated by the Garden Club of America. Smithsonian Gardens maintains 11 gardens around the Smithsonian Institution’s grounds and also has a good blog here. It’s RHS Chelsea Flower Show time! Their website is here. All The Telegraph’s Chelsea coverage is here; The Guardian’s is here; The Independent’s is here. The New York Times reports on how gnomes will be allowed in the show this year (only), here. In the Herald (Dublin), “Diarmuid Gavin has branded the Chelsea Flower Show ‘dull’ and described Prince Harry’s garden at the centenary exhibition as ‘bad,'” here. Studio ‘g’ has photos of the Best in Show winner — the Australian garden — here, and they promise more pictures to come. Also, check out The Galloping Gardener’s report, here (thanks to GD by CM) — Gardenista’s, here — and The Enduring Gardener’s, here. Anne Wareham of thinkinGardens comments on two of this year’s entries, here. Sources for seeds for cow parsley — plant of the moment at this year’s show, according to Gardenista — here. Instagram photos tagged #chelseaflowershow are here. GAP Photos has 103 photos of Chelsea, here. More photos, as well as plant lists, are posted on Shoot, here. Where have you found good photos or reviews of the show? Wow…I was trying to find the time to see what’s been written about the show and here you’ve pulled it all together!!! So what did you think of the Best in Show Garden. I was just looking at the Australian garden on Studio G. Beautiful. . . I like the Billabong (isolated, seasonal pond) concept. The mixed planting is lovely, although I had to smile a little at the report that “it presents a sustainable habitat.” I know what they mean, of course, but I also think of the intensive efforts (money, labor, and skill) that goes into creating each (glorious) fake of the Chelsea gardens. I look forward to mulling over all the photos that will come out this week. I was sorry I couldn’t like Prince Harry’s garden more, since he seems to have gone into it with such enthusiasm.